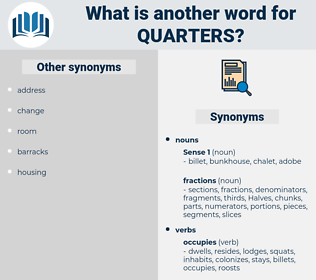 What is another word for quarters? Dormitories, encampments, cantonments, dorms, CAMPS, three-quarters. 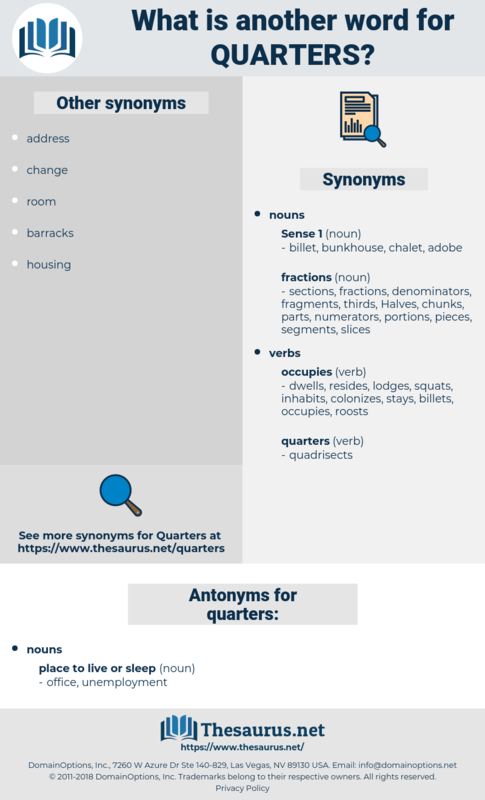 quarts, quarterfinals, apartments, Households, bedrooms, Warehouses, enclosures, terraces, shelters, rentals, residences, suites, administrations, sections, representatives, compartments, tents, perspectives, directions, courses, hostels, Penitentiaries, installations, matters, estates, streams, tranches, semesters, Personalities, stores, spaces, creatures, classrooms, equivalents, destinations, settings, strands, institutions, portions, organisations, aspects, tenants, streets, Environments, instances, designations, Neighborhoods, residents, shantytowns, cubicles, desks, panellists, worlds, interlocutors, constituents, occupants, regards, Slums, tiers, practitioners, outposts, Addresses, persuasions, clusters, sources, protagonists, subdivisions, attachments, stockpiles, sheets, recipients, Facilities, repairs, suburbs, realms, jurisdictions, mixtures, spheres, settlements, Arenas, districts, CENTS, passages, disciplines, aggregations, intervals, shores, swathes, cabins, latitudes, classmates, interpreters, Workplaces, stakeholders, avenues, seniors, professions, entrants, personages, lounges, seasons, landscapes, counterparts, segments, suits, sites, durations, jobs, periods, cabinets, venues, proportions, routes, SPARES, enclaves, centres, LABS, outlets, Residencies, points, condos, extremes, features, groupings, mandates, WEBSITES, Categories, developments, pavilions, performances, cliques, Organizations, blocks, occupiers, shares, centers, HQS, responders, shops, ranks, corners, components, habitations, embankments, zones, dimensions, grades, Operators, Habitats, SHOALS, Prisons, homes, circuits, months, tribunals, ends, boroughs, Databases, pits, annexes, Tracks, teams, fragments, productions, Tendencies, interests, Locales, participants, rankings, waterways, departments, intakes, localities, Telephones, positions, posts, pillars, supplies, wetlands, thirds, Industries, levels, pockets, allocations, intervenors, investors, courts, knots, speakers, stools, rows, Paths, Activities, backgrounds, materials, Beds, audiences, delegates, endpoints, Pleadings, Records, submissions, buildings, creditors, townships, Angles, Halves, clubs, platforms, informants, stands, beginnings, Branches, activists, centimes, modules, Benches, cages, booths, exhibits, FACETS, jails, groups, margins, echelons, individuals, Orderlies, Lives, fronts, forces, Cells, chapters, DIMES, LANES, opponents, Patches, cases, trades, bits, layers, suppliers, contacts, documents, Feet, Shots, compounds, sorts, media, Mediums, bunks, purviews, cycles, frontiers, Matrices, springs, modes, corridors, Currencies, Entities, Communities, vouchers, Pennies, divisions, domains, dosages, doses, Forums, Fora, bores, attempts, Selections, Phalanges, PATHWAYS, Boxes, ranges, Schools, hues, Properties, Agencies, DISCS, regions, contexts, partners, spells, pieces, drifts, origins, shifts, Vacancies, Families, edges, makers, Survivors, factions, blades, Watches, Classes, panels, networks, Dependencies, cabs, agents, rounds, pews, cantons, swarms, colleges, orbs, chairs, Ones, PODS, Persons, slices, tries, phones, Chaps, items, types, flags, blocs, PAGES, bands, flanks, Gains, Movements, kinds, globes, offices, Canopies, niches, holdings, Donors, Coins, fonts, figures, LUMPS, horizons, engines, Voices, providers, gangs, nickels, sponsors, players, Births, scenes, locals, brows, songs, walks, members, chunks, Guns, Territories, powers, Countries, actors, counts, Bodies, towns, Plays, bankers, birds, cuts, LINEs, barracks, Cas, rooms, parts, seats, terms, flats, authorities, three-fourths, fields. sectors, fourths, Constituencies, trimesters, circles, premises.
" I will give you the letter presently, O'Connor; I have it in a pocket - book at my quarters. They were now within three - quarters of a mile of the Court, and they had been walking for nearly an hour since they had left the Castle Inn.